Thieves have stolen a priceless collection of tropical birds from the Natural History Museum collection in Tring, Hertfordshire. 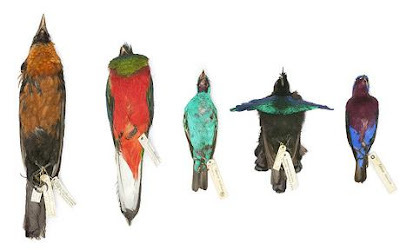 Curators said almost 300 brightly-coloured specimens were taken, some of which are more than a century old, and which are a priceless part of the world's ornithological heritage. Detectives said the artefacts may have been stolen to order for a collector or for their valuable plumage. They fear the irreplaceable birds may be ripped apart for use as fishing lures, in dressmaking or costume jewellery. Detective Inspector Fraser Wylie, who is leading the inquiry, said the birds were clearly deliberately targeted, possibly by an expert. He said: ''This is a very unusual crime and we are keen to recover the bird skins, which are part of our national heritage. Humans never cease to amaze me with their inability to just "be good." These skins are not only valuable to the folks at the Hertfordshire Museum - they are valuable to all of us and deserve to be respected. Just shameful.